It’s always good to see marketers learn from their past mistakes. Remember the Brown is the New White t-shirt from Macy’s? Well, no more of that. 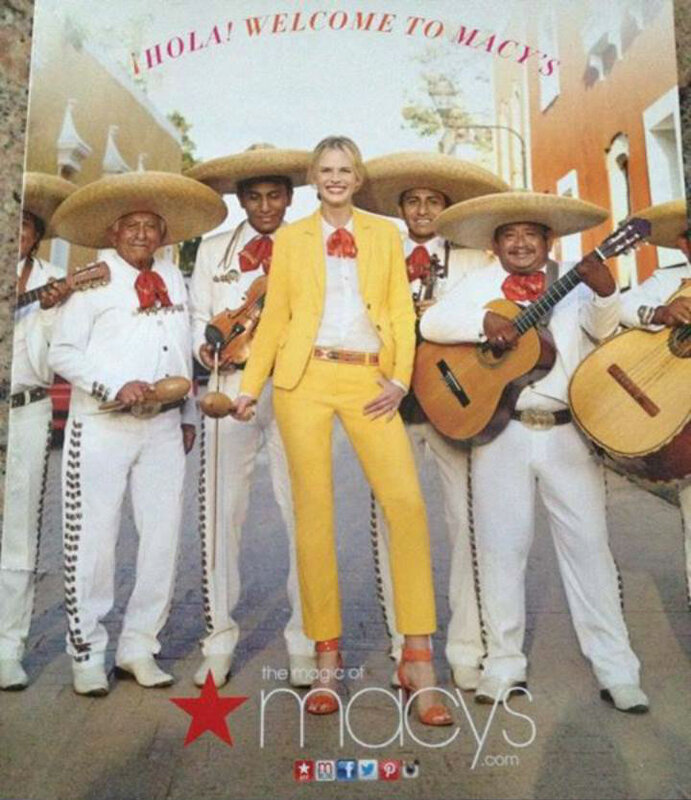 Instead of launching ethnically-relevant products to please Latino shoppers, Macy’s seems to have changed course and it’s now using tall, unmistakably non-Hispanic blonds to pitch a … are you ready?… “mariachi-style” suit. According to Macy’s own blog, the new collection doesn’t stop there. It promises tons of other Mexican-themed things, including –what else?– plenty of sombreros. I don’t know you, but I feel like living la vida loca lived by these nice ladies up here, so don’t judge me if the first thing I do when I go back to New York is rush to 34th Street & Broadway. Who doesn’t want to look that fabulous? This entry was posted in Fashion, Hispanic ad agencies, Latin America, Marketing & Advertising and tagged fashion, Macy's, mariachis, Racism. Bookmark the permalink. The “Urban Sombrero” episode of Seinfeld seemed so ridiculous and yet here we are. “Tall, unmistakably non-Hispanic blonds” is Avery narrow minded view of what Hispanics “look like”. I’m sick of hearing this. I’m not what most people from the U.S. call typical Mexican, and I find it extremely offensive! Mexicans are as diverse as the population of the U.S. Stop trying to make us all fit into your cookie-cutter image of Mexicans. Agree with Samantha, well said. Come on people need to educate themselves. que foto la de los sombreros rosados.